Mimisbrunnr.info commissioned its first logo rendition from artist the Red Boar's Daughter. The Red Boar's Daughter's work frequently draws from medieval manuscript illumination combined with the idiosyncratic (readers can see more of her excellent work here). Using the Mimisbrunnr.info template for its core inspiration (see below), the Red Boar's Daughter incorporates a few new elements into her rendition of the logo, namely Hugin and Munin, Odin's ravens, and a root of fennel, referencing the Old English Nine Herbs Charm. Both elements reference the god Odin and his many reflexes in ancient Germanic culture. In the Nine Herbs Charm, fennel is prescribed as one of nine herbs used in connection to the healing abilities of Wōden, the Old English extension of the Odin deity complex. Probably put to parchment somewhere around the 10th century, the poem sees Wōden annihilating a serpent with with nine wuldortanas, usually translated as 'glory twigs' (perhaps referring to runic magic — yet compare the Old Norse theonym Ullr, cognate with Old English wuldor). Odin took the head and smeared herbs on it so that it wouldn't rot, and sang galdr over it. As a result, he gave it the power to speak with him and to reveal to him things hidden. Odin is associated strongly with ravens throughout the Old Norse corpus, so much so that some of his many names refer directly to his association with these uncannily intelligent birds. Perhaps the most notable mention of this duo can be found in the Poetic Edda poem Grímnismál. The stanza details that the birds—whose names mean are usually roughly translated as 'thought' and 'memory' respectively—fly across the land of men, Miðgarðr, every day. Interestingly, Odin provides a little insight into his thought process by revealing that he fears for the loss of Hugin but remains more worried yet by the prospect of losing Munin. Exactly what one is to make of this is open to interpretation. The Mimisbrunnr.info logo consists of three distinct elements that come together to signify one of the major wells of Norse mythology, Mímisbrunnr (literally 'the well of Mímir'). 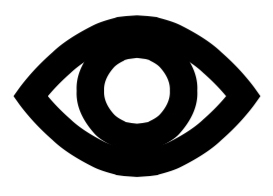 These elements are (I) the sacrificed eye of the god Odin, (II) the ripples as the eye descends into the well, and (III) the reflection of one of the major roots of the cosmic tree, Yggdrasill. The Mimisbrunnr.info logo is a blueprint for other artists and was illustrated by Joseph S. Hopkins and rendered by designer Örjan Bellind. Our current revision of the logo, discussed at the bottom of this page, is an illustration by the Red Boar's Daughter. The well is itself represented surface ripples caused by the placement of the eye. Mímisbrunnr is mentioned several times in both the Poetic Edda and the Prose Edda, both Old Norse texts compiled in the 13th century from earlier material. Yggdrasill is a tree that is central to North Germanic cosmology. It reflects the widespread veneration of particular trees and groves found throughout the recorded history of the ancient Germanic peoples. Arguably, this tree veneration continued into folk practice into the modern period in certain Germanic regions. In Old Norse texts, Yggdrasill is said to have three major roots that reach down and draw from three major wells, one of which is Mímisbrunnr. This ash tree is the best and greatest of all trees; its branches spread over all the world, and tower over heaven. Three roots hold the tree up and they are spread wide apart; one root is with the Æsir and another with the rime thurs, where Ginnungagap once was; the third stands over Niflheimr; under that root is Hvergelmir, and Níðhǫggr gnaws on the root from below. But under the second root, which extends to the rime thurs, is the well of Mímir, wherein knowledge and wisdom are hidden. The owner of the well is called Mímir. He is full of wisdom, for he drinks from the well with the Gjallarhorn. All-father [Odin] once went there and asked for a drink from the well, yet he did not get it before he left one of his eyes as a pledge. Yggdrasill alternately seems to also have been known as Mímameiðr (Old Norse 'tree of Mímir'). During the foretold cataclysmic events of Ragnarök, it appears that the greenery of the tree (referred to as Hoddmímis holt; Old Norse 'Forest of Hoard-Mímir') will house the two surviving human beings, who will go on to replenish humankind.